Our client found our Travertine cleaning and restoration services online and contacted us about our Travertine restoration services to because their floor had scratches, dirty grout and lots of dirt-filled holes. 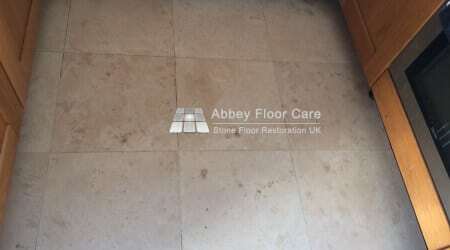 The floor was over 10 years old and the original surface finish had worn away, leaving a dull, porous finish. There were also lots of holes filled with soil. Dirty holes are a common problem with honed and filled Travertine. Travertine has a honeycomb structure, much like cinder toffee. The honeycomb structure means that in some places the holes are very near the surface ad the covering can be as thin as an eggshell. As the tiles wear, these thin areas can collapse to reveal the underlying hole. The holes fill with soil, and eventually, there are dirty holes all over the floor. Dirty grout is a common problem with tile and stone floors. The grout gets dirty because sand based grout has a rough surface like sandpaper. The rough finish can be tough to clean. Mopping with a cotton mop adds to the problem because the mop moves dirty slurry into the grout. The dirty sludge starts to damage the grout, making it porous. 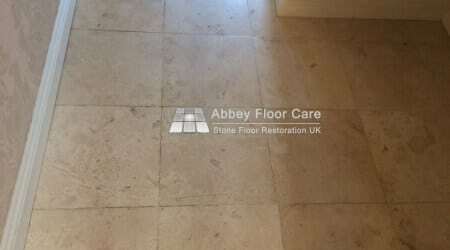 I started cleaning the floor using a strong Travertine cleaner and a rotary scrubbing machine. 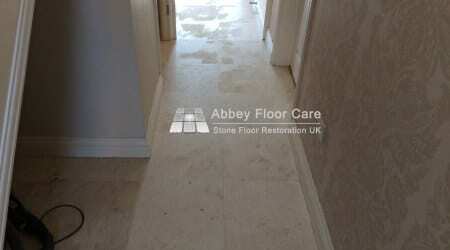 The cleaning was followed up with pressurised water rinse equipment to lift the emulsified soil away from the floor. The cleaning also removed any loose filler that was likely to fall away in the coming months. I cleaned out any damaged filler from the larger holes with a diamond burr. Then filled these holes with hard Travertine filler. The Travertine filler is a two-pack process with a filler and a chemical hardener. Once the filler had solidified, we ground the filler smooth with the surface of the stone. Small holes are too small and too numerous to fill with a hard filler. So I filled the remaining holes and any areas of lost grout with a fine jasmine coloured grout. Once the grout dried, we removed any grout haze off the tiles ready for sealing. I sealed the floor with a water based impregnating sealer, followed by 4 coats of an acrylic mid-sheen surface sealer. The sealer sits on top of the stone, acting as the wear layer, protecting the surface of the tiles from damage. The sealer also makes the grout lines and grout filler much easier to clean. 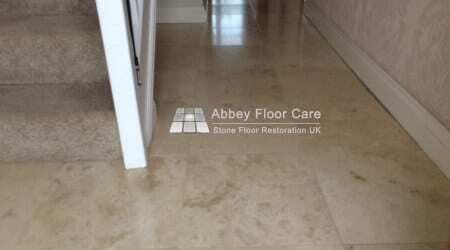 We recommend dry sweeping a Travertine floor once or twice a day, using a dry microfiber flat mop. 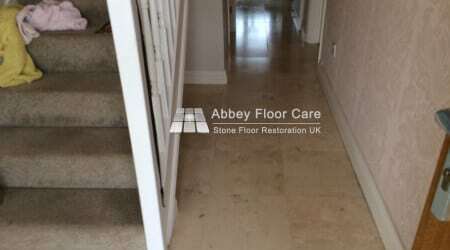 Then daily damp mopping with a specialist Travertine cleaner that contains a small amount of sealer, helping maintain the finish. With correct maintenance, the finish can last four years. You can extend the life of the finish by topping up the sealer every 6 to 12 months with a new layer of sealer. 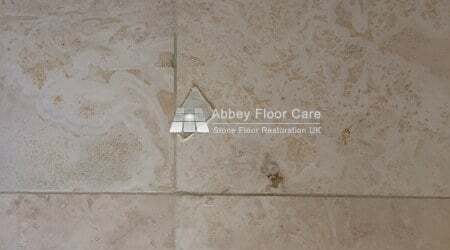 If you need your Travertine looking clean and beautiful again, please contact Abbey Floor Care for a free no-obligation quotation for Travertine restoration.